ABC News chief foreign correspondent Terry Moran claimed on Friday that a male-majority overturning the controversial Roe v. Wade would not be legitimate. Moran also claimed that “millions of women” will feel “annihilated inside” if Judge Brett Kavanaugh is confirmed. “I mean, overturning Roe vs. Wade by an all-male majority, two of whom have had credible accusations of sexual misconduct lodged against them would not be a legitimate action. And that is the question of the court. Legitimacy. It has always had a high place in American, in the American popular opinion, and it could lose it if it loses legitimacy,” Moran said. 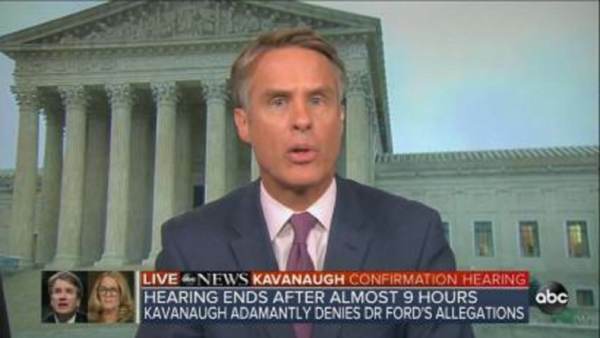 Earlier in the segment, Moran also claimed that “millions and millions of women” will feel “annihilated inside” if Kavanaugh is confirmed. “I can’t imagine the feeling of the millions and millions of women, and others who found Dr. Ford very, very credible. And if, as seems likely, Republicans are able to get — to get Judge Kavanaugh onto the Supreme Court, they’re just going to feel annihilated inside,” Moran asserted. Kavanaugh’s confirmation was held up on Friday when “Republican” Senator Jeff Flake asked for a delay so that the FBI could investigate the wild allegations against him.